It seems pretty obvious that as the NCAA Tournament rolls around Arizona will likely be a popular Final Four pick and possibly the Vegas favorite to cut down the nets. With a come-from-behind win against a good Michigan team (how good we'll find out over the next few months) away from home it seems this might finally be the Sean Miller Arizona squad that can actually make noise in the NCAAs. (Note: Yes, Arizona did make the Elite Eight as a No. 5 seed in 2011, losing to eventual National Champion UConn but I didn't consider that the type of great Arizona team Miller was seemingly putting together with his superb recruiting). Arizona is, by far, the best team out west and seems a lock for, at-worst, a No. 2 seed in the NCAAs. The longer the Wildcats stay unbeaten, of course, the more a No. 1 seed seems very likely. Saturday's win lifted Arizona to 11-0 with non-home wins coming against San Diego State, Duke and now Michigan. That's a very solid road/neutral resume and we're only in mid-December. Most impressive is Michigan seemed to be at full strength and the crowd was absolutely rocking. It helped the Wolverines take a 35-26 lead into halftime and carried over as a dunk opened the second-half scoring and gave Michigan an 11-point lead. That's where Arizona began chipping away, the way teams with legitimate title hopes tend to do on the road. 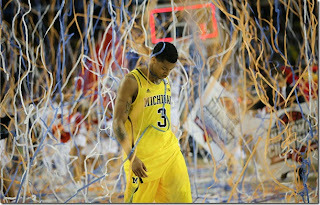 When the dust settled it was Arizona 72, Michigan 70. In short, there was so much NBA talent on the United Center floor Tuesday night that most people were more enamored with the fabulous freshmen and their offensive exploits. Likely lost in the shuffle was the defense that - while it might not have looked like it - made some of the offensive highlights that much more impressive. 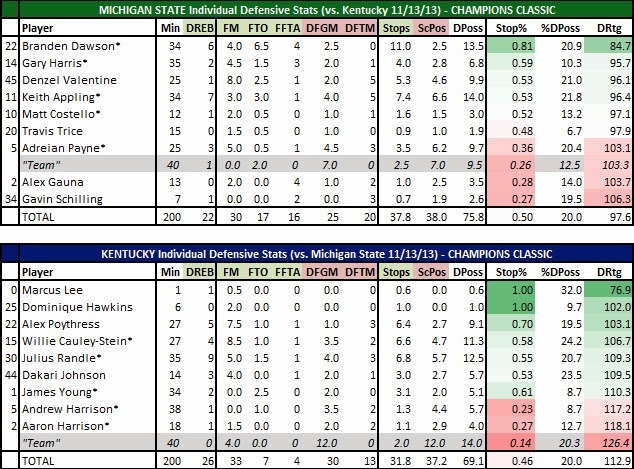 I charted both Michigan State and Kentucky's defense, possession by possession. If things play out like many experts believe, it might not be the last time I chart a game between these two superpowers. One of these guys - Joeckel or Fisher - will go No. 1 to Kansas City. Ah... the 2013 NFL Draft comes to us tonight with a few huge questions. The biggest questions, in my eyes, are: What happens with the first two picks, and what will Philadelphia do at No. 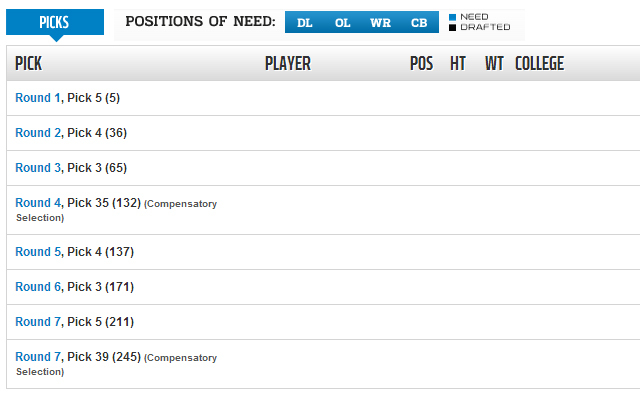 4 if the Eagles don't find a trading partner. 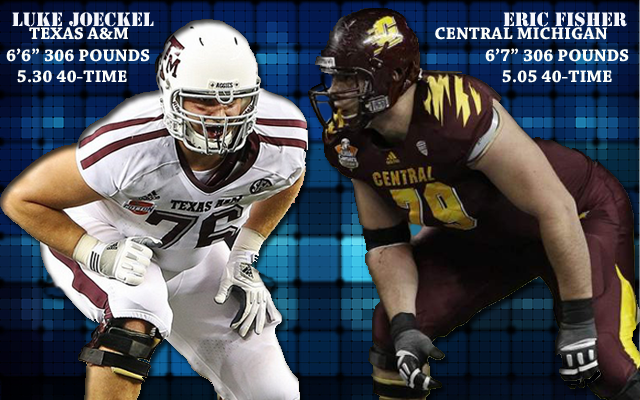 Those moves seemingly will shape how the draft goes. With the Detroit Lions' pick at No. 5 the draft could get interesting. If the Lions take Dee Millner - what I said Detroit should do without a second of hesitation in my earlier post on Detroit's draft needs - it leaves BYU's Ziggy Ansah in a potential free fall or as a hotly-coveted player resulting in an early trade. If Detroit does indeed take Ansah (or if the below Top 5 makes up the NFL Draft's Top 5 in some order) then it leaves potential Top-5 guys like Millner or Dion Jordan there for the taking. Every so often a really, really good team has a really, really bad year and ends up with a high draft pick in the following season. That's what I believe happened with the Detroit Lions in 2012. I should preface that by saying a really good NFL team can easily go 7-9, 8-8, or 9-7 in a given year. The Lions were a lucky 10-6 team in 2011 when a lot of things went right. The team was even more unlucky last year in falling to 4-12. In reality, both teams probably should have been closer to the 8-8 mark based on talent. 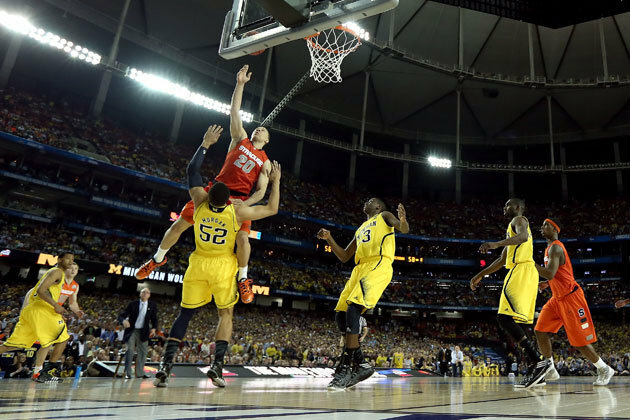 Many will say Michigan's offense has carried it to Atlanta for this year's Final Four. That's true for the most part but it would be wrong to ignore the defense during the four-game run through South Dakota State, VCU, Kansas and Florida. It has been 20 years since Michigan last reached the Final Four. That is, of course, if you ignore vacated records since Michigan’s Fab Five had both their 1992 and 1993 Final Four appearances (and national title game appearances) wiped from the record books. Regardless, this is an exciting time in the state of Michigan because, for the first time in more than 20 years both Michigan and Michigan State have elite teams. 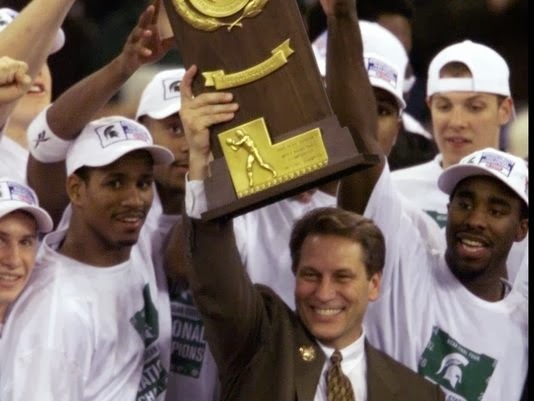 That said, this weekend isn’t about Michigan State – a team that had reached six Final Fours, seven Elite Eights and won a national championship since the last time Michigan reached the Sweet 16 (1994) and this season. This is about how the nation’s last undefeated team back in January, survived a fall from the No. 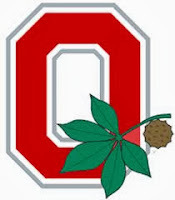 1 ranking, endured a brutal 1-3 stretch against the Big Ten’s best, withstood heartbreak in the season finale that had a layup fallen the other way a Big Ten championship would have been in the rafters, and shook off a quarterfinal loss in the Big Ten Tournament to take a slap-in-the-face No. 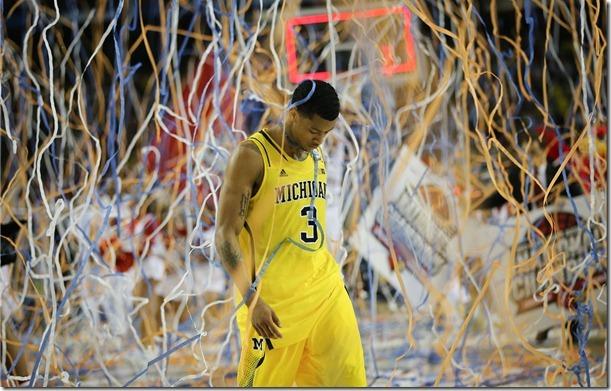 4 seed and march to the 2013 Final Four. Did it take some luck? Sure, but every March run has a dash of luck. Kansas had to collapse, including missing the front end of a 1-and-1 with 10 seconds to play and Trey Burke had to drain a 30-foot 3-pointer to send the game into overtime. As improbable as that was, it’s the kind of stuff March dreams are made of. If there was any doubt Michigan’s run was all luck th0se thoughts were cast away with an absolute 79-59 shellacking of Florida, the No. 1 team in the country via efficiency numbers for much of the year. Now the Wolverines have a date with Syracuse – a team that no one outside the state of New York can possibly root for, starting with a smug, curmudgeon coach who refuses to play any sort of challenging nonconference schedule and ending with an unpredictable-at-best style of play. Michigan vs. Syracuse for a spot in the 2013 national title game. Let’s get it on! 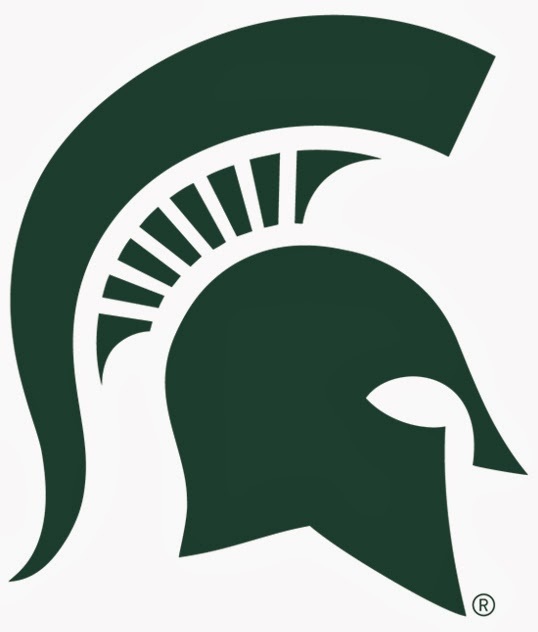 Quite simply, Michigan State laid down the hammer defensively against Memphis to reach the Sweet 16 for the fifth time in six seasons and 11th time in Tom Izzo's tenure. MSU's 70-48 win against a team many thought would give the Spartans trouble is what makes it that much more impressive. What a wild year projecting the bracket. Not only was the bottom of the bubble as soft as usual but as many as seven teams have legit claims for a No. 1 seed. 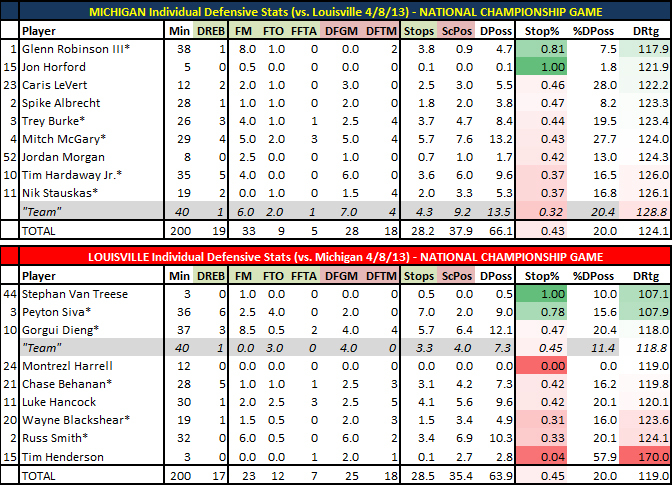 Analysis: Louisville gets the slight edge over Indiana for the overall No. 1 seed (and a spot in Indianapolis) because it won its conference tournament. The committee will say that doesn't matter but history says it does (a lot). Gonzaga could get bumped to the No. 2 line but the Zags profile is just as good as Kansas and Miami's - two teams that also won regular season and conference tournament titles. 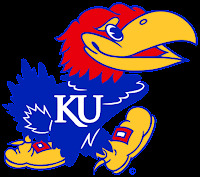 I like Kansas's profile slightly more than Miami's so the Jayhawks get the final No. 1. 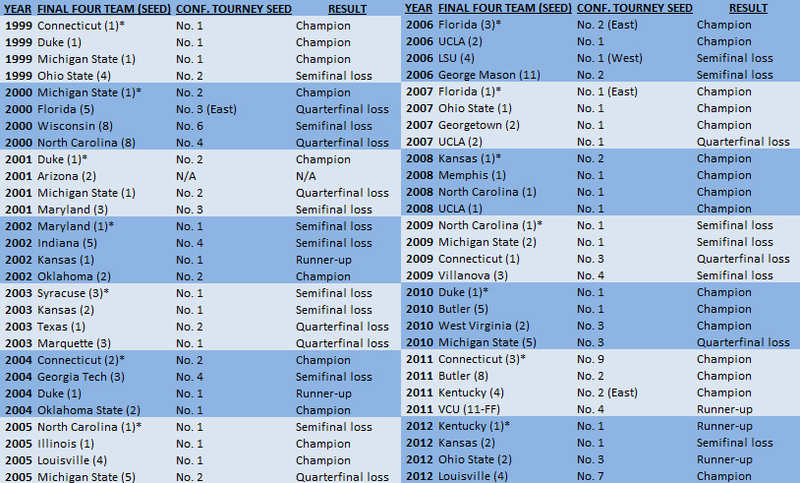 Duke is an interesting case: It's rare for a team to not only fail to win its conference tournament and receive a No. 1 seed but almost as rare for a team not to win the regular season title either and grace the top line. 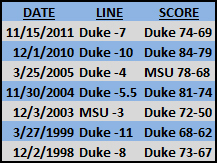 I think too many teams passed Duke (slightly) this week for the Blue Devils to be on the top line. Bubble: My last four teams are all "major" schools, but that's because I have Boise State and Middle Tennessee State in the field as No. 11 seeds. Every team is flawed at the No. 11 line and below but a team like La Salle really has a bad profile. Nothing sticks out as being good and everything screams NIT. I don't think any non-Explorer fans will be complaining about the Explorers being in the NIT. FINAL FOUR: If this was the actual bracket all four No. 1 seeds look like Final Four teams to me. Duke presents the challenge to Indiana as well as Miami to Kansas. It's going to be a wild ride regardless. Welcome to the 2013 Big East Championship. After years of entertaining the nation at Madison Square Garden this year’s version of the Big East Championship will be the last as we know it. That doesn’t mean we should get all sappy and treat this as any other event than a great one to put a few bucks down on our hopeful champion pick. Technically, the tournament began yesterday but don’t kid yourself, no one was paying any attention to the South Florida-Seton Hall and Rutgers-DePaul games unless you wanted to see what a potential NCAA Jamaican basketball team might look like. The crux of the tournament begins today, not surprisingly with a game with more bubble implications than you might think. Cincinnati, for all the big wins its accumulated this season (Iowa State, Oregon, at Pitt at vs. Marquette) it still finishes 9-9 in a mediocre Big East this season. With the unbalanced schedule you can see how there weren’t a lot of marquee Big East wins and a lot of losses. Cincinnati lost at Providence and at home against St. Johns and also registered five of its conference wins by sweeping Rutgers and beating DePaul, Seton Hall and South Florida. That folks, means Cincinnati got 55 percent of its Big East victories against the league’s four worst teams. Nothing says “bubble” to me like that resume. Now, when comparing Cincinnati’s resume to others it would seem a lot of teams would have to have magical conference tournament runs to pass Cincinnati but beating Providence would be a good idea just to be safe. Speaking of Providence, somehow the Friars (17-13, 9-9 Big East) are appearing in some of the “First Eight Out” sections of bracket projections. Come again? Apparently a resume that has the following: Sweep of Villanova and home wins against Cincinnati and Notre Dame is NCAA Tournament worthy. 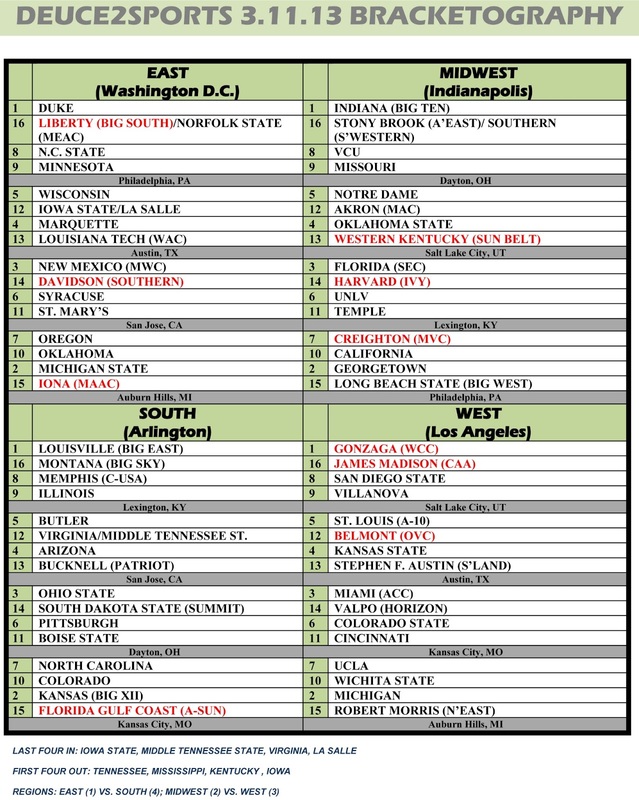 Heck, I haven’t even mentioned a pathetic NCSOS that included loss to… wait for it… UMass, Penn State, Boston College and Brown. Yet, in some people’s eyes (maybe the committees?!?) the Friars are on the bubble. At the very least it makes for interesting theater for today’s noon tip. LOUISVILLE (+140): Not surprisingly, Louisville is your overwhelming favorite. What is surprising is that Georgetown – one of the three-way Co-Champions – has the fourth-best odds and Marquette – another co-Champion – has the fifth best odds. With so much stock put into conference tournaments Louisville might have to win the Big East Tourney to keep its projected No. 1 seed. (Like it or not the selection committee has a really bad habit of giving No. 1 seeds to conference tournament champions with slightly less remarkable bodies of work than to teams with stellar bodies of work who fall short in conference tournaments). That gives Louisville all the motivation it needs. Couple that with the fact Louisville has won 10 of 11 games – the only loss being the 5 OT thriller at Notre Dame – and the Cardinals are peaking at the right time. And if you believe that the conference’s best team is going to win this tournament then Louisville at +140 is well worth your time. Maybe it’s the statistical nerd in me but I love comparing computer algorithms projections and Vegas’ odds. Usually they’re pretty much the same but every now and then you find a “glitch” that could be a big payday. Based on the two sets of numbers we have you see how Vegas still likes Georgetown (2nd favorite) while the computers do not (fourth). You’ll also notice how Pittsburgh goes from Vegas’ No. 4 to the computers’ No. 2. PITTSBURGH (+550): That means Pittsburgh, the team that always schedules softly in the nonconference but always muscles its way through the Big East for a decent NCAA seed is the big sleeper here. It’s no secret that Pitt has had great success in the Big East Championship. Jamie Dixon reached the title game in four of his first five seasons, finally winning the title in his fourth try (2008). Since then, however, Pitt hasn’t been back. The Panthers lost in the quarterfinals as the No. 2 seed in both 2009 and 2010 and as the No. 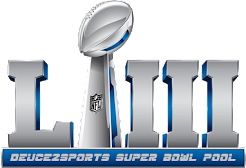 1 seed in 2011. Last season was a disaster as Pitt was the conference’s No. 13 seed and lost in the second round. Now, Pitt hasn’t exactly beaten great teams. Let me clarify: Pitt whooped Georgetown early in the Big East season. The Hoyas then went on to win 14 of their final 16 games to claim a share of the conference title. On Jan. 8 when the teams met Georgetown and title weren’t said in the same sentence outside of some playful office jokes. The win against Syracuse was right at the time the Orange started their downward spiral. So, while Pitt has shown the ability to win games it did spent much of the later part of the conference season beating up on the lower-tier teams. With the bracket in front of you now, you can see why Louisville and Pittsburgh seem like the good bargains. It’s all about matchups. The only two “challengers” to Pitt are Georgetown (Pitt won at Georgetown 73-45) and Syracuse (Pitt won at home 65-55). Louisville, assuming it can get past the Villanova/St. John’s winner (the Cardinals beat S. Johns at home 72-58 but lost at Villanova 73-64), it would play either Marquette ( a team it beat at home 70-51) or Notre Dame (a team it should have beaten twice but lost the aforementioned 5 OT game in South Bend 104-101 to go with a season-ending 73-57 home victory). Georgetown (+400): I’m trying to understand why more people aren’t on the G’Town bandwagon. The Hoyas have been very consistent all season outside of that home clunker vs. Pitt. My guess is people feel this is the Otto Porter show and the guy can’t keep it up for three straight days. But keep this in mind: Georgetown has a real shot at a No. 1 seed if it wins the Big East Championship (assuming it includes the Pitt/Syracuse winner and either Louisville or Marquette). Getting a “cheap” title by beating some streaky high seed (Villanova) might get the Hoyas the title but not the marquee win it needs. At 4/1 the Hoyas are actually a decent buy here. Syracuse (+500): If you pre-January 26 Syracuse this is the bargain of the year. That was when the ‘Cuse was 18-1 and looking like a legitimate title contender. The Orange are 5-7 since with its best win being a home win against Notre Dame. All the losses are respectable and to NCAA teams (outside of UConn which would have been in the tourney as a 9/10/11 seed). But Syracuse not only has been losing games but it has looked bad in doing so. The last game at Georgetown highlights this: The final regular season Syracuse-Georgetown clash and you go out and score 39 points? Yes, that would have beaten both South Florida and Seton Hall in regulation Tuesday night but it’s a pathetic number for a team with third best odds to win this tournament. This is one of those “if-we-make-it-look-like-people-are-high-on-Syracuse-maybe-others-will-follow” lines. Don’t believe the faux hype. Marquette (+900): If you like hardworking teams then Marquette is the squad for you. Unfortunately hard work only gets you so far (see a Sweet 16 ceiling). That hard work also seems to pay off more at home than on the road. Marquette went 16-0 at home while going just 5-6 on the road. Marquette has never reached the Big East finals, only getting to the semifinals in 2008 and 2010. This is a decent longshot to take but the deck seems stacked against the Golden Eagles. Notre Dame (+1500): Like Marquette the Irish are a much different team at home than on the road. The Irish have never reached the finals but have reached the semis, most recently last season before falling to eventual champion Louisville. I do believe Mike Brey has it in him to get this team to win four games in four days, but this is the likely road the Irish would face: Rutgers, Marquette, Louisville, Georgetown/Pittsburgh. That is a really tough climb but stranger things have happened at MSG, right? Villanova (+2200): The Wildcats have the wins that seemingly have cemented them into the Big Dance. Keep in mind every one of them came at home. Even when St. John’s is a bad team it is still tough playing them in this event since it is on their home floor. That won’t be an opening-game cakewalk for the Wildcats. 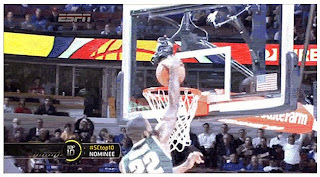 Still, I could see ‘Nova making some kind of shocking run but I think a spot in the finals is the ceiling here. Gamble on the Wildcats at your own peril. Cincinnati (+2200): Somehow I have more faith in these Bearcats. The No. 1 seed in this tournament has lost its first game in two out of the past three years. (It did reach title game the three years before, winning it twice). Still, somehow teams getting to play the day before seem a little more fresh compared to the rusted No. 1 seeds. Now, I think Georgetown will be reach for Cincinnati (or Providence if the Friars pull the upset) but as we mentioned above the Bearscats have a lot on the line and winning as many games as possible wouldn’t be a bad idea. Field (+2500): If you’re playing the field you’re honestly saying you think either Seton Hall or Rutgers is going to win this thing. (Providence is listed at +3500 and St. John’s is at +7000). If that’s the case I suggest you find another hobby. Play St. John’s at +7000 for the simple fact the Red Storm are seeded higher than both No. 11 Rutgers and No. 12 Seton Hall and are playing home games. If you play the field you’re an idiot. THE PICK: I’ve toggled back and forth with this. It’s between Louisville, Georgetown and Pittsburgh. Pitt is the big sleeper but Louisville and Georgetown are the best teams. In my heart of hearts I believe this Cardinals team is similar to the 2008-09 version that won this tournament en route to the overall No. 1 seed in the NCAA Tournament. I see the Cardinals potentially benefitting from some other upsets and cutting down the Madison Square Garden nets for the final time. Louisville at +140 is the call. Can a team win the NCAA National Championship despite losing its first conference tournament game? 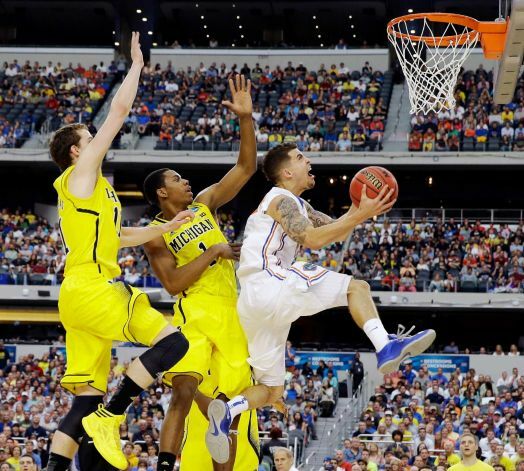 Do Final Four teams tend to be conference tournament winners? Does a conference tournament early exit actually help a team (re: more rest) or spell March disaster? Due to the abundance of these questions I took on the unenviable task of looking at every Final Four team since 1999 and charting that team's result in their respective conference tournaments. That's 56 Final Four teams, 55 of which played in a conference tournament. (2001 Arizona didn't play in a conference tournament because the Pac-12 didn't have a tournament from 1991-2001). Only one thing tends to hold true: No team has lost its first conference tournament game and won the NCAA National Championship. That said, nine teams have reached the Final Four after a first-game exit in their league tourney. 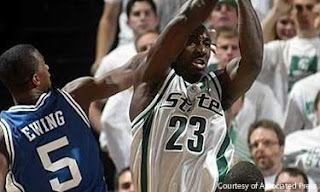 However, just one of those nine teams - the 2000 Florida Gators - reached the championship game after losing the first game of its conference tournament. There were two big surprises: First, only five conference tournament runner-ups reached the Final Four (compared to a combined 24 semifinal and quarterfinal losers). Second, 41 of the 55 teams were either No. 1 or No. 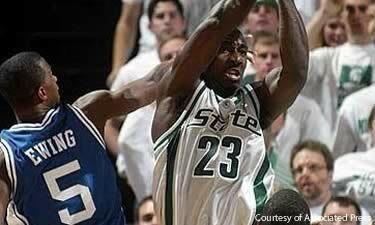 2 seeds in their respective conference tournaments. What it says is your Final Four "sleepers" are more likely to be under-seeded teams that fared well during the conference season than a team that had a mediocre season and made a little surge in the conference tournament. It might be worth noting two of those "No. 5 seed or Higher" teams have reached the Final Four the past two seasons (eventual champion UConn in 2011 was the No. 9 seed in the Big East Championship and Louisville was the No. 7 seed in the Big East Championship in 2012). So, the morel of the story is the expectations for your team in the NCAA Tournament should dictate how much stock you put into a conference tournament. If you think your team is a possible national champ then make sure it wins its first game. If the Final Four is your ceiling then don't sweat a conference tournament loss as much as the experts want you to. I might be in the minority but I firmly believe I'm right when I say the following: Duke, Indiana and Gonzaga have locked up No. 1 seeds. While the Zags won the WCC Tournament last night it would be shocking to see Duke and Indiana lose in the quarterfinals in their respective ACC and Big Ten Tournaments; it would be even more shocking if that cost either team a No. 1 seed. We throw around "body of work" an awful lot and then we put so much emphasis on a 4-day, neutral-site conference tournament that becomes nothing more than a foot in the entire body of work. The point is, Kansas, MSU, Michigan, Louisville and Miami have all had nice seasons, but they are still a rung below Duke and Indiana. I suppose it's possible a few teams could pass Gonzaga, but it seems criminal that a 31-2 Gonzaga team with the schedule it played in the nonconference coupled with WCC dominance wouldn't get a No. 1 seed. Worst case for the Zags seems to be the final No. 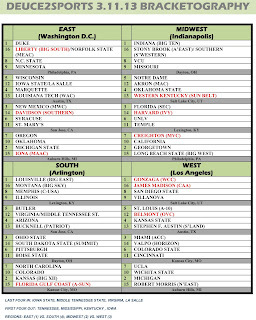 1 seed if a team like Louisville - our projected fourth No. 1 seed today, wins the Big East Tournament and passes Gonzaga no the S-Curve. I don't believe Kansas, MSU, Michigan or Miami can pass the Zags at this point. (Michigan might have the best shot with a chance to run through a Wisconsin-Indiana-MSU/OSU gauntlet to the Big Ten Tournament title, but it's still unlikely that would be enough). "Last Four In" update: I struggle to see where a team like Middle Tennessee State doesn't get in. At 28-4 the Blue Raiders would have the most wins of any team not in the field. 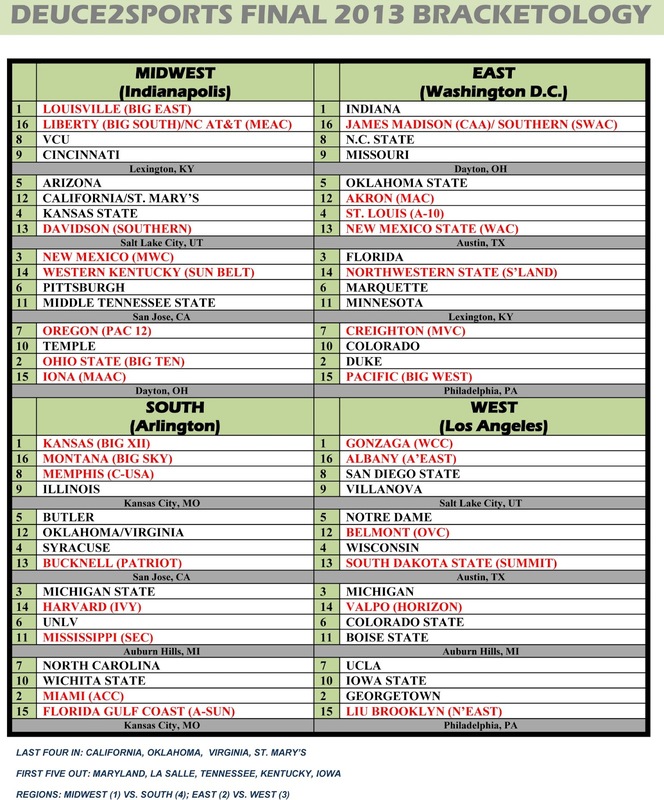 Of course, MTSU doesn't own a Top 50 win and only two Top-100 wins. Either way the Blue Raiders will be the "first" in one category. I think the committee does the right thing and rewards MTSU for its season rather than taking a middle-of-the-road BCS school (I'm talking to you, Kentucky and Mississippi). Obviously, the kicker here is the "big boys" have more time to notch big wins and the recency effect is always in play. 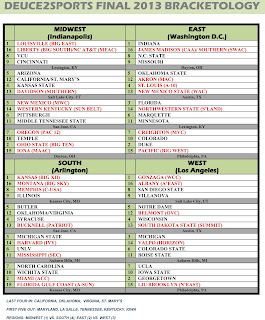 Still, I think the First Four will end up having two mid-majors and two major schools - the way it should be. "First Four Out" update: It's like a SEC Tournament on this line. The SEC doesn't deserve three bids but it might get it if one of these teams can knock off Florida or Missouri this week. Beating up on each other doesn't add much to an already mundane resume. The SEC Tournament, in terms of NCAA Tournament implications, might be the most fun to watch. (The Big Ten, obviously, will be the battle of the heavyweights and should be uber-entertaining).